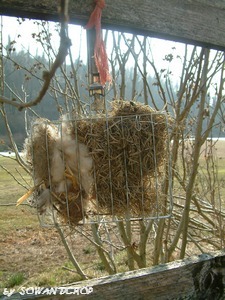 Substitute your bird feeder with nasting feeder. Categorie: Curiosità, Giardino per i nostri amici, My projects | Tag: bird, nesting time, nido, uccelli | Permalink. which I’d like to ask if you do not mind. I was curious to know how you center yourself and clear your thoughts prior to writing. I have had difficulty clearing my mind in getting my thoughts out. I truly do enjoy writing but it just seems like the first 10 to 15 minutes tend to be wasted simply just trying to figure out how to begin. Any ideas or tips? Appreciate it! For your question don’t mind. Honestly I don’t plan my thoughts before writing them. When I decide to write about something, I only start to tell my ‘fairy tale’ and try to share it (its emotions and its teachings) with all that would like to stop on my pages, by simple words and above all by photos taken by myself. Try to image of telling a story to kids, and I think you succed in writing spontaneously.